I Pledge Allegiance To Linguistic Obfuscation Linguist Geoff Nunberg says what makes the pledge important isn't the meaning of the words — it's the way we've managed to keep the words from meaning much of anything at all. There's something almost willfully obtuse about the way people talk about the language of the Pledge of Allegiance, whichever side they're on. Earlier this month, the 9th Circuit Court of Appeals ruled that the words "under God" could remain in the pledge — the first time a court had addressed the constitutionality of the phrase head-on. In the decision, the court's majority called the pledge "a proud recitation of the ideals on which our Republic was founded." You'd think this was one of those culture-war curriculum battles, a debate over the syllabus of the first-period civics class. But what makes the pledge important isn't the meaning of the words. It's the way we've managed to keep them from meaning much of anything at all. Obscurity has been built into the pledge since Francis Bellamy created it in 1892. It was ostensibly designed to rouse the patriotic attachments of schoolchildren, particularly the recent immigrants who might need extra encouragement. But Bellamy obviously wasn't thinking of all those little Solomons, Svens and Sergios when he chose to start with the words "I pledge allegiance." That was an arcane scrap of feudal English that had made its last appearance in the loyalty oath that Confederate soldiers had to sign to recover their rights after the Civil War. But the reference was obscure to most people even in Bellamy's time, and the words have always been utterly opaque to schoolchildren. In fact, "pledge allegiance" is what linguists call a hapax legomenon, or hapax for short — an expression that only occurs in a single place in the language, like wardrobe malfunction, Corinthian leather or satisfactual. Or let's not leave out my favorite, ginchiest. People don't pledge allegiance to Hadassah or the U.S. Marines or Kappa Kappa Gamma, much less to other inanimate objects. We only use the words when we're either quoting the flag pledge or riffing on it. So there's no independent reference point, no way to know what you've just signed on for that you weren't down for already. Of course kids are mystified by most everything in the pledge. But "one nation under God" has the distinction of being a phrase that not even grown-ups are clear on. Congress inserted the words at the height of the Cold War in 1954 to underscore the difference between American values and those of the atheistic Communists. But its actual meaning is up for grabs. Does it affirm our faith in God or assert that we have his special protection? Is it a ceremonial deist formula with no especial religious character? Or is it merely a historical nod to the beliefs of the founders, as the 9th Circuit majority said? You can take this wherever you like, because "under God" is another hapax legomenon that doesn't occur anywhere else in modern English. People don't say things like "Western Europe isn't under God anymore," or "She only goes out with men who are under God." That ambiguity has certain advantages. But it actually came about because of a linguistic misunderstanding. The words were taken from the Gettysburg Address, where Lincoln asked his listeners to resolve that "this nation, under God, shall have a new birth of freedom." Except that in the Gettysburg Address, "under God" didn't modify "this nation" but the following phrase, "have a new birth of freedom." In Lincoln's time, "under God" was a common idiom that meant "with God's help" or "the Lord willing." People used it to qualify a bald prediction or promise, mindful of the admonition against vainglory in the book of James. Actually, my guess is that Lincoln would have inserted the words "under God" if he had written the Pledge of Allegiance, too, although he probably would have put them at the end. He would have been uncomfortable about describing the country as indivisible, just and free without adding a "God willing" somewhere. I doubt if the people who pushed for inserting "under God" in the pledge realized they were changing the meaning of Lincoln's words. Most of them would have had to learn the Gettysburg Address by heart back then, but nobody ever stopped to parse it, no more than children parse the Pledge of Allegiance now. Anyway, it doesn't matter — what's important is that Lincoln sanctified the words, however we've repurposed them. Whatever you take the phrase to mean, it gets the "G" word in there, which is enough to satisfy some people and offend others. And it doesn't matter much what schoolchildren make of the phrase, either. As Eric Hobsbawm once said, patriotic rituals exist to instill a sense of membership in a club, not to enumerate its bylaws. Really, the whole pledge is just one big hapax legomenon, a string of syllables that only comes to life in classrooms and school assemblies. But there's a lesson for children in that: The attachment to flag and country is a unique bond that requires a special language of its own. In theory, the pledge could do most of the same work if we had children say it in Anglo-Saxon or Arapaho, or if we replaced it with the lyrics to "Zip-a-Dee-Doo-Dah." They're going to turn the words into jabberwocky anyway: "I led a pigeon to the flag," "one Asian under guard." So do the words matter at all? Well, yes, in a way. 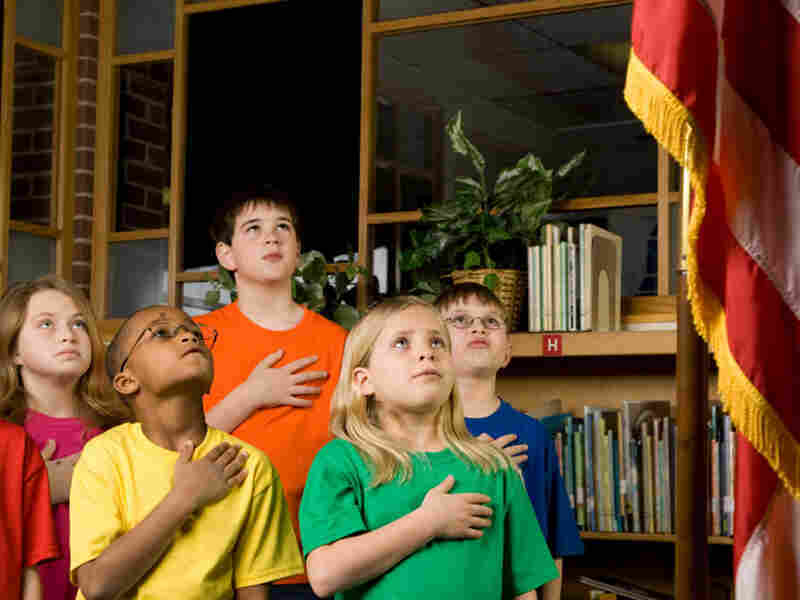 Reciting the pledge doesn't teach kids anything about the meanings of its words. But learning to speak American involves something more than that — it's knowing how to incant them, too.